This is the most in-depth analysis of inequality and social polarization ever attempted for a preindustrial society. 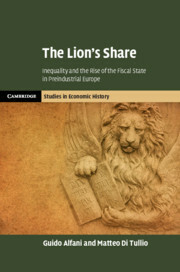 Using data from the archives of the Venetian Terraferma, and compared with information available for elsewhere in Europe, Guido Alfani and Matteo Di Tullio demonstrate that the rise of the fiscal-military state served to increase economic inequality in the early modern period. Preindustrial fiscal systems tended to be regressive in nature, and increased post-tax inequality compared to pre-tax - in contrast to what we would assume is the case in contemporary societies. This led to greater and greater disparities in wealth, which were made worse still as taxes were collected almost entirely to fund war and defence rather than social welfare. Though focused on Old Regime Europe, Alfani and Di Tullio's findings speak to contemporary debates about the roots of inequality and social stratification. List of figures; List of tables; Acknowledgements; Introduction; 1. The Venetian fiscal system: centre and periphery; 2. The rich and the poor; 3. Economic inequality in the long run; 4. Taxation, redistribution and inequality; Appendix: building regional distributions of wealth for the Republic of Venice and for Veneto; Archival sources; Printed sources; Bibliography; Index. Guido Alfani is Professor of Economic History at Università Commerciale Luigi Bocconi, Milan. His recent works include Calamities and the Economy in Renaissance Italy: The Grand Tour of the Horsemen of the Apocalypse (2013) and, with Cormac Ó Gráda, Famine in European History (Cambridge, 2017). Matteo Di Tullio is a research fellow in early modern history at Università degli Studi di Pavia, Italy and a member of the Dondena Centre at Università Commerciale Luigi Bocconi. He is the author of The Wealth of Communities: War, Resources and Cooperation in Renaissance Lombardy (2014).